Hypoxia (low O2) is a pathophysiological condition resulting from the imbalance between cellular O2 consumption and vascular perfusion. Hypoxia is a common feature of solid tumors associated with increased chemoradioresistance and poor patient prognosis. Metazoans have evolved mechanisms of adaptation to hypoxia that are mediated by hypoxia inducible factors (HIFs), a family of heterodimeric basic-helix-loop-helix transcription factors composed of an O2-regulated HIF-α subunit (HIF-1α, HIF-2α and HIF-3α) and a constitutively-expressed HIF-1β subunit. In well-oxygenated cells, HIF-α subunits are hydroxylated on proline residues by the oxygen-dependent prolyl-4-hydroxylases (PHDs). Proline hydroxylation allows the binding to the von Hippel–Lindau protein (pVHL), an E3 ubiquitin-ligase targeting HIF-α for proteasomal degradation. In addition, HIF-α undergoes asparaginyl hydroxylation by factor inhibiting HIF-1 (FIH) under non-hypoxic conditions, which prevents binding of HIF-α to the co-activators p300/CBP. Under hypoxia, PHD and FIH activity is substrate limited, resulting in rapid HIF-α accumulation, nuclear translocation and dimerization with HIF-1β. Transactivation occurs upon HIF-1 binding to DNA consensus sequences within the promoter of target genes, defined as hypoxia responsive elements (HREs). HIF-1 promotes the expression of hundreds of genes involved in cell autonomous and non-autonomous adaptations to hypoxia. Examples of genes and their functions are found in the diagram. HIF-α can be upregulated at the protein level via mTOR or at the mRNA level via STAT3 and NF-κB signaling. 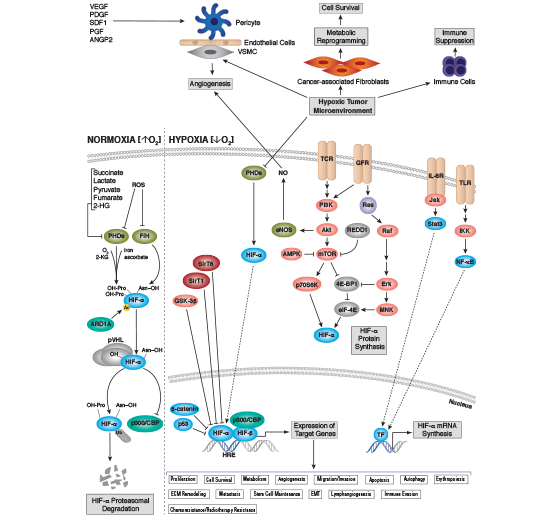 HIF-1 exerts pleiotropic effects on both cancer and stromal cells. For example, HIF-α-dependent expression of VEGF-A and PDGF-B induces angiogenesis by promoting proliferation and migration of pericytes, endothelial and vascular smooth muscle cells. In cancer-associated fibroblasts (CAFs), HIF-α mediates extracellular matrix (ECM) remodeling and metabolic reprogramming supporting cell survival. In addition, HIF-α promotes the expression of cytokines that suppress the adaptive immune system by stimulating the recruitment and activation of myeloid-derived suppressor cells (MDSCs), regulatory T cells (Treg) and tumor associated macrophages (TAMs) leading to an immunosuppressive environment. L. Schito and G.L. Semenza. (2016) Trends in Cancer , 2(12), 758-770. Gilkes, D.M., Semenza, G.L., and Wirtz, D. (2014) Nat Rev Cancer 14, 430−439. Karar, J. and Maity, A. (2011) Front Mol Neuro. 4, 51. LaGory, E.L. and Giaccia, A.J. (2016) Nat Cell Biol. 18, 356−365. Lee, K.E. and Simon, M.C. (2015) Cell 163, 1288. Masoud, G.N. and Li, W. (2015) Acta Pharmaceutica Sinica B. 5, 378−389. Palazon, A., Aragones, J., Morales-Kastresana, A. et al. (2012) Clin Cancer Res. 18, 1207−1213. We would like to thank Dr. Luana Schito, Princess Margaret Cancer Centre and The Campbell Family Institute for Cancer Research, University Health Network, Toronto, Ontario, Canada, for reviewing this diagram.